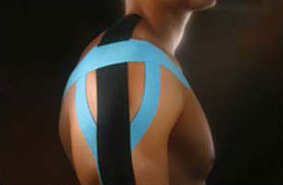 Kinesio-Taping is rapidly growing in popularity among athletes and anyone who wants to facilitate the healing process. Kinesio-Taping gives support and stability to your joints and muscles without affecting range-of-motion. It is also used for preventive support, edema, to treat pain, increase circulation, and assist with lymphatic drainage. The Kinesio-Taping method is applied over muscles to reduce pain and inflammation, relax overused tired muscles, and to support muscles in movement on a 24 hr/day basis. The tape normally lasts 3-5 days and provides support between treatments. K-tape is most commonly seen on professional and Olympic athletes, but is also helpful to the whole population. It can protect an injured muscle or have the ability to activate muscle groups. These are used to balance muscles and bring them up to functional level. The first is applied for overuse, acute injuries, and rehabilitation. In such cases the tape is applied insertion to origin. The second is applied for increased muscle function and to address chronic conditions. Origin to insertion taping is used here. K-tape is the next step of functional medicine.